Siemens Energy has released a free browser game aimed at educating consumers about sustainable energy. Gamers frustrated with the DRM issues of Electronic Arts' SimCity have a new option. 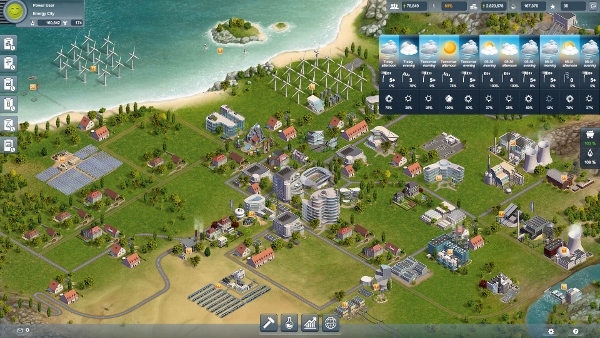 Siemens Energy has developed a free online game that challenges users to design a sustainable energy system for a city. The simulation game Power Matrix aims to generate an understanding of the mechanisms and rules of the energy market and to provide insights into the interaction between different power generation types and power grids. Power Matrix is not only geared towards experts and experienced online gamers. In fact, it is primarily intended for members of the general public who are interested in the topic. The player takes on the role of an energy manager in a rural area whose task is to contribute to the growth of a city by creating an intelligent energy mix and providing a stable power supply. Possible energy sources include both conventional technologies and renewables, such as wind and solar power. The better the energy mix you can create by combining the different energy sources, the faster your city grows. You can also collect bonus points by investing in research and development, for example. You must always keep an eye on the available budget however, in order to ensure a sustainable and efficient use of resources. "Today's power generation and distribution depend on a large number of immediately interdependent variables. We wanted to create an easy-to-understand game that portrays the energy market of the future and that can also get across a complex issue in a transparent and easily intelligible manner", is how Jan-Peter Schwartz, Corporate Vice President of Communications at Siemens Energy, explains the idea behind the game. Power Matrix explains the correlations and processes of the individual variables involved in energy economics with the help of simulation and strategy games that have universal appeal, i.e. not only on the gaming scene. The online game is based on an idealized and simplified view of reality and was developed in collaboration with experts from the fields of gaming, corporate strategy and engineering. The game provides general descriptions of technologies and technical possibilities for products and solutions in the field of energy economics. "When we were developing the game, we were especially keen to create a scenario that was true to detail and as realistic as possible. This allows players to experience the immediate influence of changes in weather conditions on the performance of renewables, for example", says Thorsten Uhlendorff, Head of Online Communication, who is responsible for the Power Matrix Game project at Siemens Energy. See what the unknown holds!